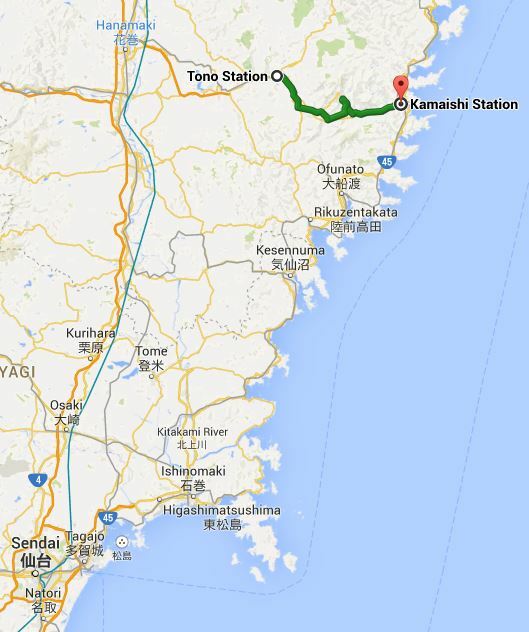 On Sunday 1st June I made an early start from Tono and headed along the Kamaishi Line on a little train that only runs every two hours to a fishing and industrial town called Kamaishi (釜石). Ali Muskett-san. 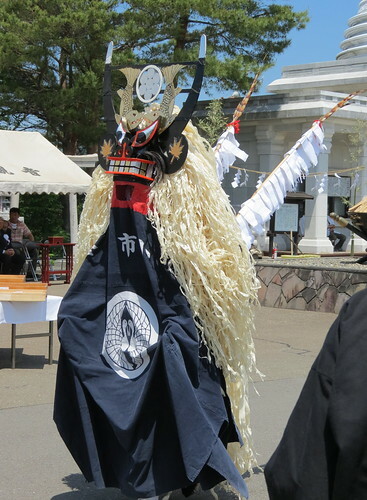 On Sunday 1st June there will be a festival called the ‘Festival of Fire’ at the Kamaishi Daikannon. By all means, please come. 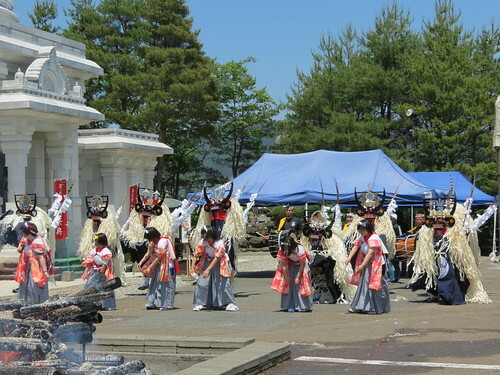 The response also included a link to the Kamaishi Daikannon website, which confirmed that the festival would begin around 10am, that there would be a ‘deer dance‘ or ‘shishi odori’ (鹿踊), followed by a fire ceremony, and the festival would end around midday. How could I possibly pass up an opportunity like this? 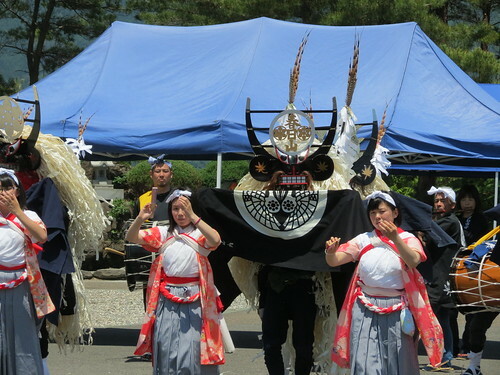 So, I arrived in kamaishi just after 9am and, knowing that the Kamaishi Daikannon (釜石大漢音) was a fair way from the station I decided to dump my bag in my hotel and grab a taxi to the festival site. 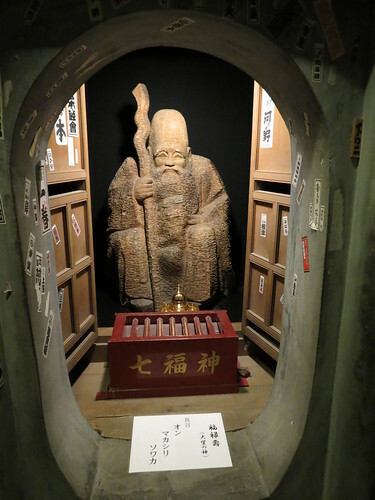 The taxi driver looked a bit surprised to see a ‘gaijin’ (foreigner) suddenly speaking bad Japanese at him and asking to go to the Daikannon, but he opened his door nonetheless and took me there. as I got out of the taxi he muttered and pointed me in the right direction, for which I thanked him. Of all the places I had visited so far on my trip, this was by far the place with the least English, and my Japanese skills were sure to be put to test! 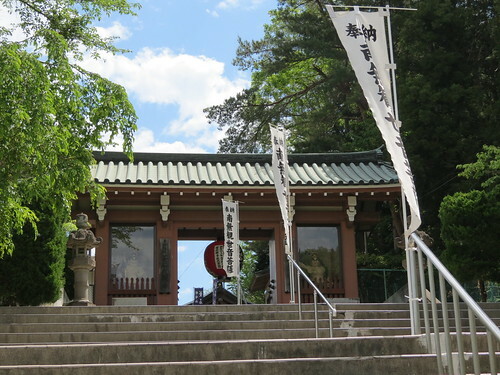 As I made my way up the steps to the entrance I wondered at first if there would really be a festival happening – it was so quiet. I reached the person in the ticket booth, and they waved me through when I tried to pay, telling me that entrance was free today because it was a festival day. やっぱり！ As I thought, the festival really was on! 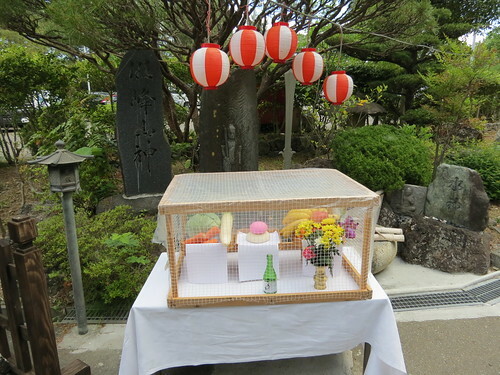 Just beyond the entrance I came across the first signs of the festival – a small altar containing offerings to the gods. Near the altar was small collection of statues, including some particularly freaky looking baby statues. 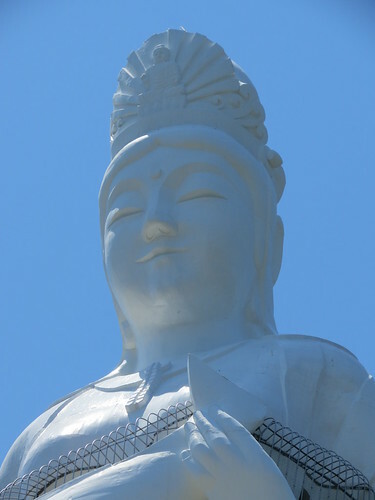 Kannon is known as the ‘goddess of mercy’ and is said to assist people in distress. 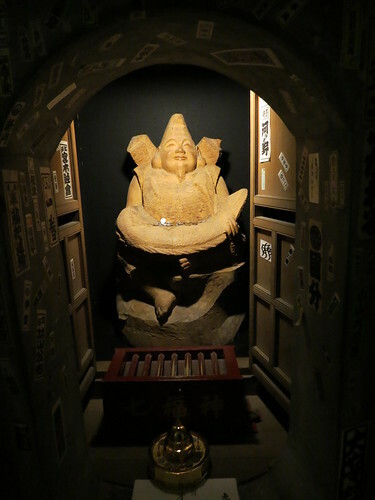 There are various versions of Kannon; popular female versions include Koyasu Kannon (child giving), Jibo Kannon (loving mother), and Gyoran Kannon (carrying fish basket). It helped that it was an absolutely gorgeous day, too! 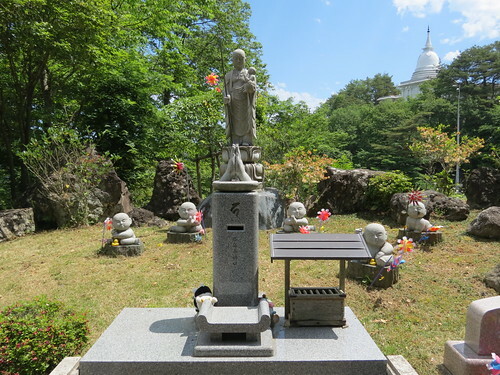 There were more signs of the festival as I approached the Daikannon, but it didn’t seem like anything was starting yet, so I decided to go inside the statue and up to the observation platform which is in the fish the statue is holding. 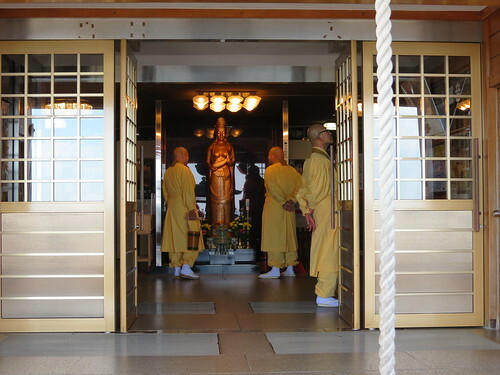 As I entered the statue I noticed there were a lot of monks around, and they soon began chanting. None of them seemed to mind my being there though, so I just passed through quietly and respectfully. 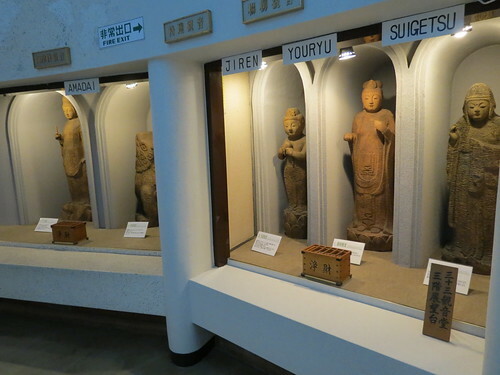 The statue was full of other statues, and all the way up (by stairs – there was no lift) I spotted more and more statues hidden in every possible corner. The steps to the top were tough, but the view was completely worth it! Would you look at that?? 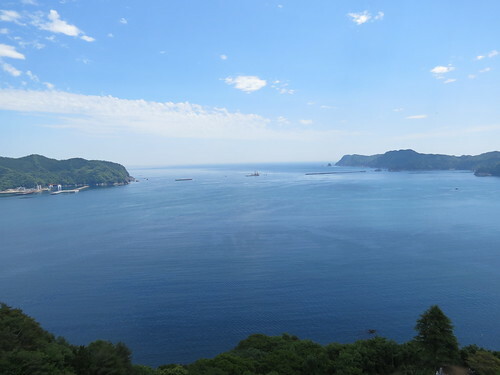 I stood for a moment, just taking in the blue of the sky and sea, and the calmness of it all. 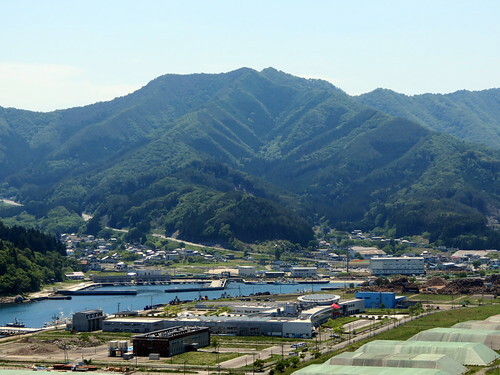 It was hard to believe that 3 years and almost 3 months before this town had been so badly hit by the tsunami of March 11th. 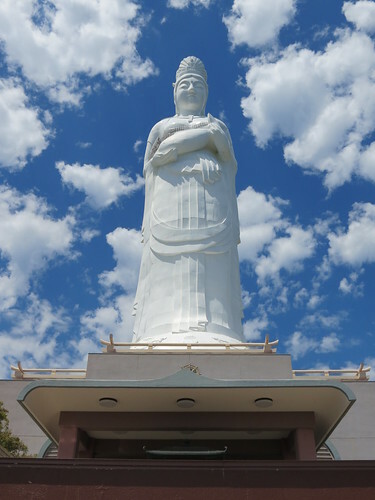 Waves as tall as 4.3 metres had hit as the 48.5 metre tall Daikannon statue had looked on. Sensing that something was about to happen, I made my way down from the observation deck just in time to hear the faint sound of flutes and drums. The procession was coming – the festival was about to begin! 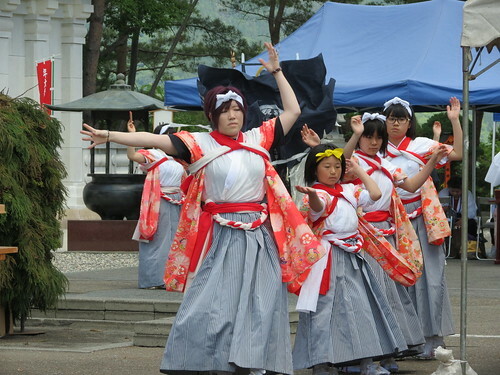 Shishi odori is a dance from Iwate Prefecture (岩手県). 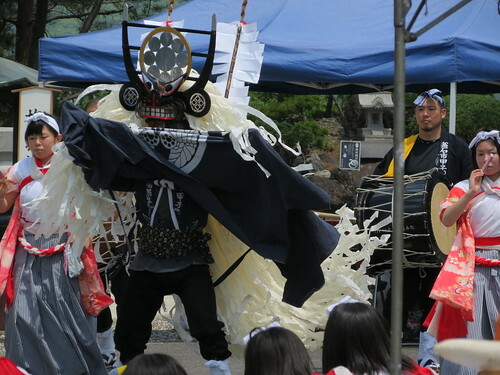 In northern Iwate the dance is performed without taiko drums, and in southern Iwate it is performed with taiko drums. 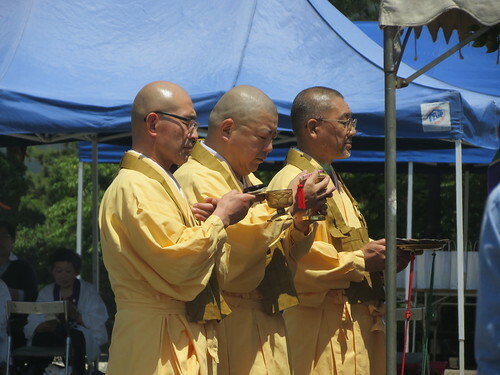 There are many stories about the origin of shishi odori, including that it was to pray for a deer that had been killed or that it was to imitate the movement of wild deer. I had seen shishi odori once before, bizarrely, in London at the Thames Festival in 2012. This festival was a little different in that it was much more of a local festival atmosphere and a little rough around the edges, but I absolutely adored it. The young girls danced with looks of concentration on their faces whilst the ‘deer’ flapped and rustled around. A festival like this is just about as close as you can get to true, ‘real’ Japan in my opinion, and I feel so lucky to have been able to attend. 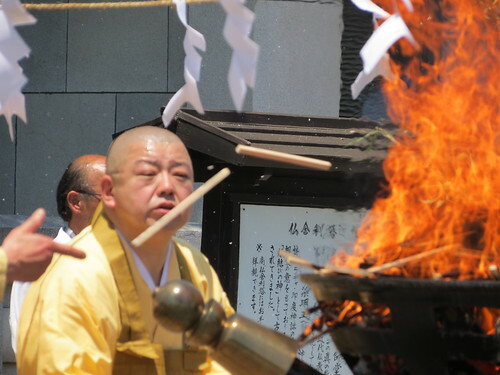 After the first shishi odori performance, it was time for the monks to perform their fire ceremony. 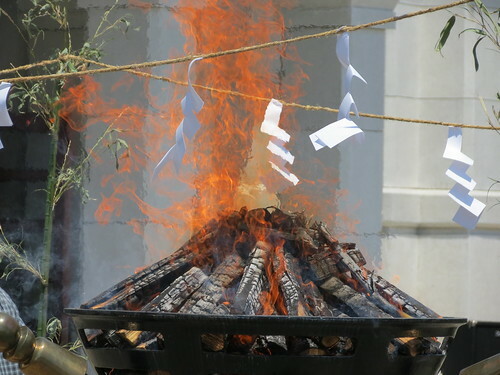 As far as I understood, people had paid around ￥3,000 each for a prayer to be written on a wooden stick, and then the prayers were read out by the monks before they threw them into the fire. 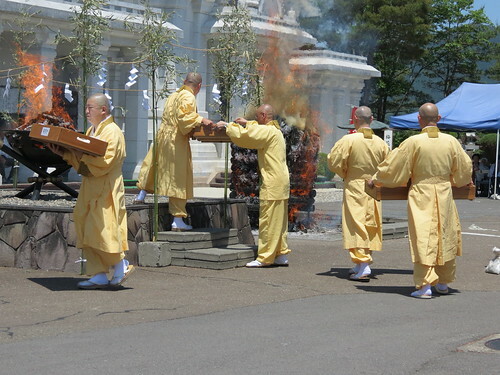 The whole time there was drumming and other monks chanting in the background, with occasional bell/gong sounds. This might sounds weird but I actually found the whole thing quite emotional… or maybe it was just the smoke getting in my eyes. 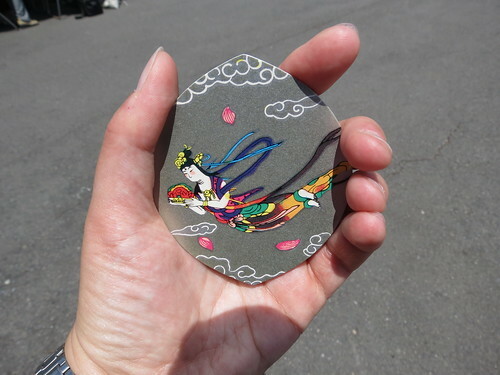 At some point during the ceremony one of the monks handed out small cards which were like ‘omamori’ good luck charms. The monk seemed surprised but pleased to see me as he placed the card into my hand. After the fire ceremony (and after the fire had been mostly extinguished, thank goodness! 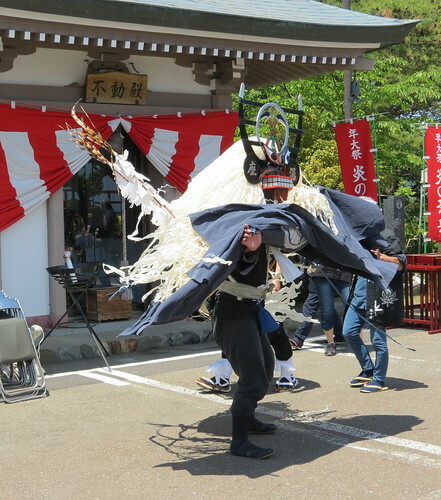 ), there was another shishi odori performance. 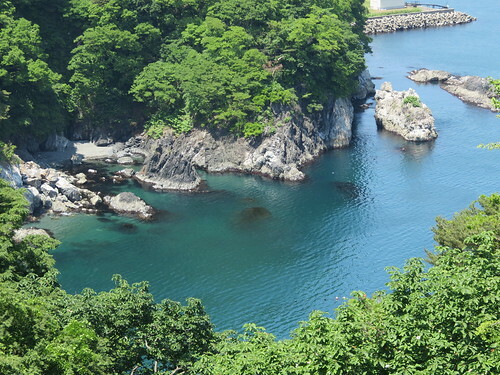 As the festival finished and the dancers retreated down the path away from the Daikannon, I wandered over to take another look at the beautiful, calm, blue sea. 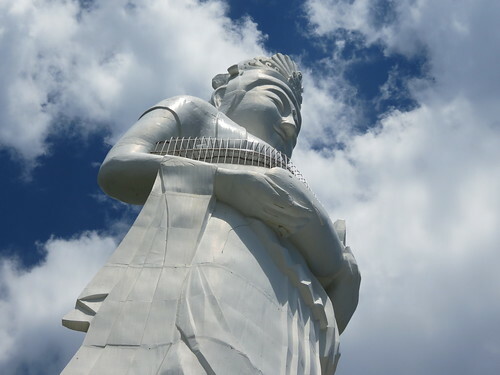 May Kannon have mercy on us all. 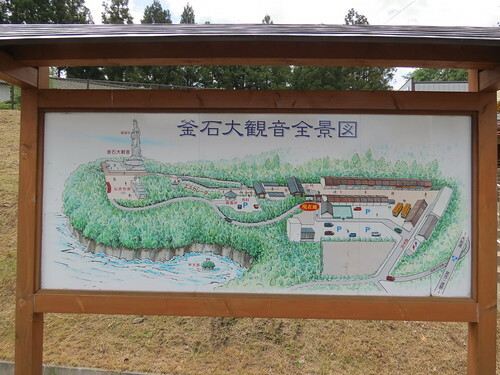 I have more to say about Kamaishi, so do look out for my next post which will talk more about Kamaishi town and what the town went through in 2011. 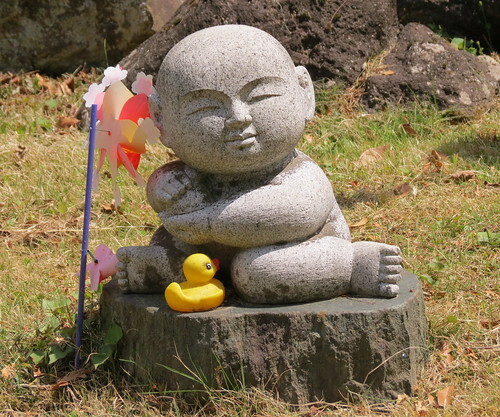 The next few posts in this series will refer to the 2011 earthquake and tsunami quite a bit. 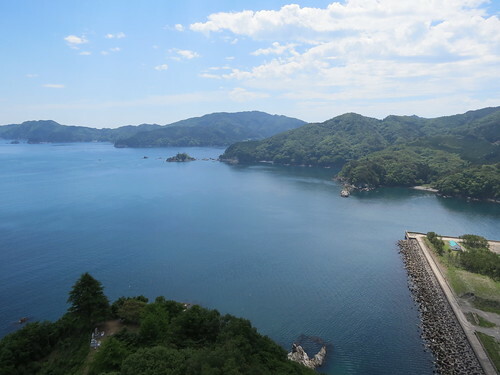 One of my reasons for visiting Tohoku was to visit the devastated area and see how things are progressing three years on. 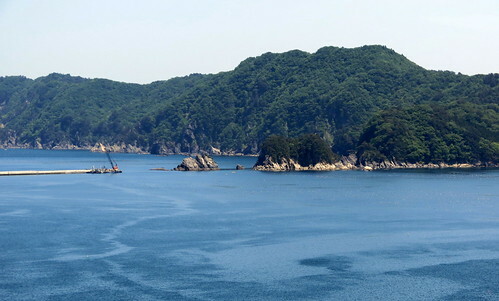 The past I am referring to is deeply sad, but the future for Tohoku is bright. We must never forget, but we must also look forward to the future. 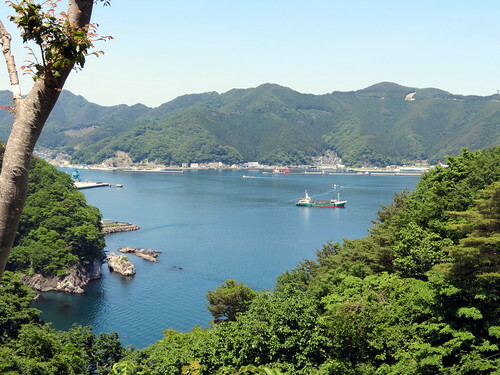 Great you were able to get off the beaten track – I’m sure your Japanese was up to it!